Fulvestrant is used to treat certain types of breast cancer. Breast cancer cells need the hormone estrogen in order to grow. Fulvestrant works by blocking the effect of estrogen, slowing tumor cell growth. Read the Patient Information Leaflet if available from your pharmacist before you start using fulvestrant and each time you get a refill. If you have any questions, ask your doctor or pharmacist. This medication is given by slow injection into the buttock muscle by a health care professional. It is given as directed by your doctor, usually every 2 weeks for the first 3 doses and then monthly. The dosage is based on your medical condition. What conditions does Faslodex Syringe treat? Pain/swelling/redness at the injection site, nausea/vomiting, loss of appetite, constipation, diarrhea, upset stomach, dizziness, tiredness, headache, hot flashes, or trouble sleeping may occur. If any of these effects last or get worse, tell your doctor or pharmacist promptly. Tell your doctor right away if you have any serious side effects, including: numbness/tingling of arms/legs, back/leg pain, bone/joint pain, mental/mood changes (such as anxiety, depression), shortness of breath, cough that doesn't go away, burning/painful/frequent urination, unusual tiredness, signs of infection (such as sore throat that doesn't go away, fever, chills). List Faslodex Syringe side effects by likelihood and severity. Before using this medication, tell your doctor or pharmacist if you are allergic to it; or if you have any other allergies. This product may contain inactive ingredients (such as benzyl alcohol), which can cause allergic reactions or other problems. Talk to your pharmacist for more details. Before using this medication, tell your doctor or pharmacist your medical history, especially of: liver disease, bleeding problems, low platelet counts (thrombocytopenia). Tell your doctor if you are pregnant or plan to become pregnant. You should not become pregnant while using fulvestrant. Fulvestrant may harm an unborn baby. A pregnancy test should be done within 7 days of starting this medication. Ask your doctor about reliable forms of birth control while using this medication and for 1 year after stopping treatment. Do not use birth control that contains estrogen. If you become pregnant, talk to your doctor right away about the risks and benefits of this medication. It is unknown if this drug passes into breast milk. Because of the possible risk to the infant, breast-feeding while using this drug and for 1 year after stopping treatment is not recommended. Consult your doctor before breast-feeding. What should I know regarding pregnancy, nursing and administering Faslodex Syringe to children or the elderly? This medication may interfere with certain lab tests (such as estradiol levels), possibly causing false test results. Make sure lab personnel and all your doctors know you use this drug. Lab and/or medical tests (such as liver function) should be done while you are using this medication. Keep all medical and lab appointments. Consult your doctor for more details. 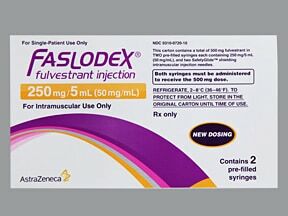 Are you taking Faslodex Syringe? Are you considering switching to Faslodex Syringe? How long have you been taking Faslodex Syringe?